Hip hip hooray it is another new year — the most exciting one! The lunar new year is filled with such good things as three mile long strings of firecrackers deafening everyone in every direction, tasty feasts with friends, and lion dances everywhere you turn, if you happen to be in the right place at the right time. 2019 ushers in the big fat year of the pig, the most delicious of the Chinese Zodiac animals. 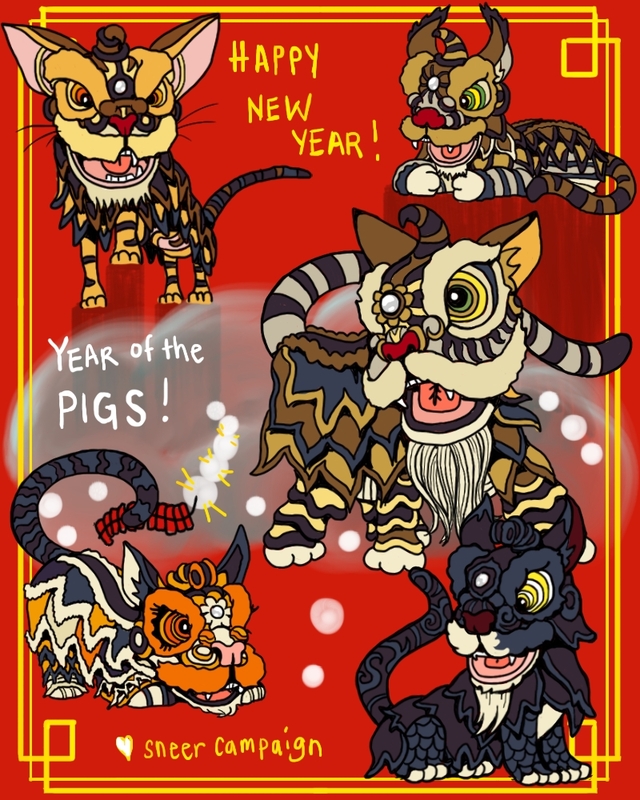 And what better way to celebrate such a year than by turning the lion creatures into lion-cats, the ones who live with us: the piggiest pigs we know? Lion Dancing is one of my favorite things to watch, fyi. I used to hang around with a Kung Fu School that offered lion dance to anyone interested in having them for openings or new year purposes. I never learned kung fu, but I did have a lion spit lettuce all over me accidentally — a fine start to a new year, let me tell you. As our gift to you, there are transparent versions of each of the cats (Zesta, Haircut, Tuff Ghost, the Captain, and Custard) to color after you print them out, if you feel like coloring them, or coloring them as cats that are in your life. Otherwise, gaze upon the card we are giving to you, and please, have the best Year of the Pig!